Learn how Department Safety Coordinators and Area Safety Coordinators differ, and what each group needs to know. Department Safety Coordinators and Area Safety Coordinators are appointed by their departments to facilitate the flow of safety information and programs from Environment, Health & Safety (EH&S) into the UC San Diego workplace. Department Safety Coordinators serve all their co-workers, regardless of the kind of work performed. Every UCSD department should have at least one DSC. Large departments and departments with multiple locations may need more than one DSC to be effective. See What Department Safety Coordinators Need to Know for more information. Area Safety Coordinators are assigned to a specific facility where work with hazardous material occurs — typically a shop, studio, or research facility. See What Area Safety Coordinators Need to Know for more information. Some departments with higher risk workplaces employ a Department Safety Officer (DSO), a career safety professional. Recommended for new and continuing department safety coordinators and supervisors. This course acquaints DSCs and supervisors with all areas of Environment, Health, & Safety: contacts, resources, policies, hazardous material business plan, emergency preparedness, and safety specialties. Contact the EH&S Safety Training Manager to schedule training. Highly recommended for increased knowledge of the role of Department Safety Coordinator. Hosted and facilitated by Environment, Health, & Safety staff, these on-going sessions provide attendees with a clear understanding of the role of the DSC, professional development, and a collegial atmosphere that encourages the sharing of workplace health and safety challenges and successes. Want to go further? Read about the Staff Education & Development Certificate Program for Department Safety Coordinators. Organize emergency preparedness for your department. Read Emergency and Earthquake Preparedness Training for options. 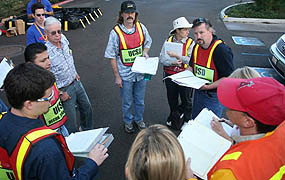 Join UCSD's Campus Emergency Response Team (CERT). Organize an emergency preparedness planning committee for your department. Prepare a Department Emergency Action Plan. Use How to Develop a Department Emergency Action Plan to get started. Read Emergency Preparedness Planning for UCSD, including UCSD's Emergency Operations Plan. Emergency Map Safety Quiz reinforces your emergency evacuation plan. Emergency Preparedness Skills Inventory asks staff to identify useful skills they can contribute in an emergency situation. How Prepared Are You? helps staff prepare their homes and families for emergencies. Review UCSD emergency preparedness and response procedures from chemical spills in the laboratory, to possible building evacuation, to a campuswide event. Post the UCSD Emergency Guide in a prominent place. Encourage everyone to register for emergency notifications. Quake-safe your workplace: Read Reducing Workplace Earthquake Hazards. Check the UCSD Emergency Status page in the event of an emergency affecting the campus. Find more resources on Emergency Preparedness. Questions? Contact Continuity & Emergency Services, (858) 534-1064 or 534-3823. Ensure fire and life safety requirements are observed. Field Operational Planner - Create customized field safety plans for UC-sponsored research or instructional field trips. Anticipate and prepare for potential risks before personnel leave on a trip. Learn about injury and illness reporting and UCSD's Workers' Compensation Program. Questions? Contact the EH&S Workers' Compensation Office, (858) 822-2979. Know how to respond and solve indoor environment concerns. See Indoor Environment for appropriate points of contact for various indoor environment concerns. Read Preventing Indoor Mold Growth. Read How to Respond to Indoor Floods. Odor complaints are among the most common calls you'll receive. Read What's That Smell? to learn about common and possible sources of troublesome (though not alarming) odors in the workplace and what you can do about them. Use the Odor Log (PDF) (Word file) to track odor and indoor environment concerns. It will help maintenance and EH&S personnel track the problem down if you call for assistance. Report safety concerns to EH&S. Use the online Safety Concern form to report a health or safety issue at UCSD. Or, to report a safety concern anonymously, call (858) 534-3660. Make sure everyone (including yourself) attends required safety training. Use the Safety Training menu to learn about required and recommended safety training for the kind of work your group performs at UCSD. Read Safety Training Checklist for Supervisors for a discussion of safety training responsibilities. Read About Safety Training for information about record keeping requirements and accessing UCSD's online safety training records. Implement the Hazard Communication Program in your department. Questions? Contact the EH&S Safety Training Manager. All archived Safety Coordinator presentations are PowerPoint files. These large files may take a few moments to open.